We’ve compiled a list of what we deem the eight most important cyber security tips that everyone should be following. Enforcing these cyber security tips will set you on the right path to cyber resilience and minimise your risk of exposure to attack. 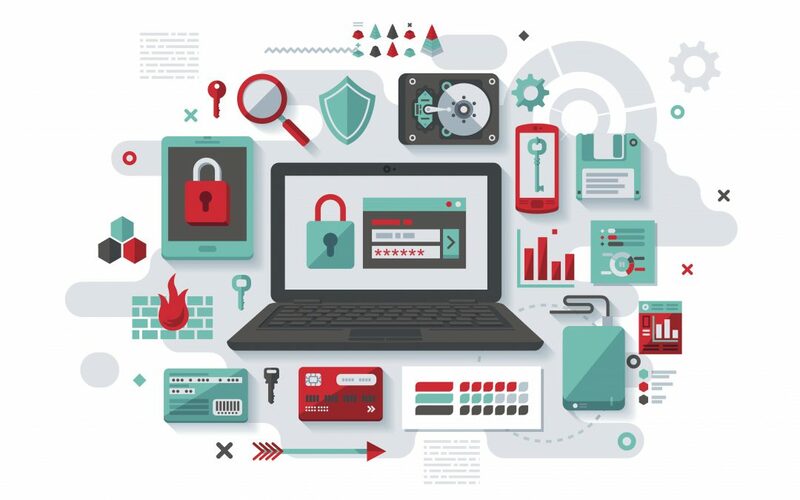 It’s important not to only rely on these steps to protect your network and business, but use them as a starting point for locking down your cyber security and ensure you regularly update and evaluate your cyber security processes, including incident and recovery plans in case the worst should come to pass. 1. Remember: It Could Happen To You! The first and most important of our cyber security tips is to never assume you won’t be a target. Thinking it’ll never happen to me is exactly the type of thinking that makes you complacent and likely to drop your guard. Always assume you are a target, and that the internet trolls are out to get you. Strong lengthy, random passwords with various character types, including upper and lowercase letters drastically reduce the likelihood of your password being guessed. Use a password manager in lieu of writing complex passwords on a post-it note. Use two-factor authentication wherever possible and ensure employees follow the same protocols. Consider using a password management system. Be aware of safe sites and links, learn to recognise phishing attempts in emails (basically never click the link!) and ensure your employees practice safe browsing too. Simple things like ‘don’t share your password online’ should be reiterated, and be suspicious of potential malware at all times. You should be regularly evaluating system access and ensuring that staff only have access to data or networks that they require for their job. Wherever there is staff turnover, ensure their access is removed and be sure to require two-factor authentication for said access. With a culture of ‘bring your own device’ becoming more prevalent, be sure you are screening all devices before they connect to your network. Laptops, mobiles, USB flash drives, can all carry malware and infect your system, so you’ve gotta be on them like white on rice. Consider mobile device management. Keep your systems up to date with the latest patches and software updates as these are usually rolled out in order to correct system vulnerabilities. Leaving your system on older versions increases your likelihood of being exploited for weaknesses. Back up all your networks and systems at regular intervals, whether it’s to a cloud-based server, or a physical one. This should be part of your standard practice anyway, but make sure it’s part of your incident response plan as well, in case things go awry. By constantly monitoring and testing your networks and devices, you’ll be the first to notice any suspicious activity. Be involved and understand how activity should normally look so you immediately notice red flags pertaining to potential attacks. Lastly, you should frequently evaluate your networks and look for ways to improve system security, whether its through employee education, changing and upgrading passwords, patching software, updating incident response plans or installing antivirus software. These cyber security tips don’t cover everything, and there are a myriad of ways to protect your business that mostly don’t require an in depth knowledge of cyber security technicalities or scouring the deep web for a hacker to penetrate your firewall. Anyone with the most basic computer knowledge can learn the fundamental steps to keep their network and data secure from outside attacks, and in the long run save yourself the financial drain and headache that follows from any breaches. If you are still not sure about how to tackle your cyber security check out our Cyber Security Guide for small to medium businesses.